While my mom was here, she able to stay with Caleb for a few days while I went to girls camp to help out. We had 4 girls from our ward there and we all had a pretty good time. There were about 90 or 100 girls total. The church owns a nice big camp ground towards the top of Mt. Lemon, about 20 miles up and about seven or eight thousand feet up. You don't even feel like you're in Arizona when you're there. It gets freezing cold at night and the weather during the day was great, which was good because we had to wear pants. 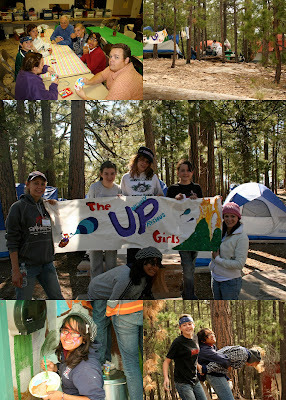 The girls did crafts, service projects, hiking, certifications in fires, cooking, and other outdoors things. The bishop came up one of the nights and brought dinner and we played games and had a really nice spiritual meeting. I think overall, the girls had a good experience and I enjoyed being there. looks like fun!! you look great!